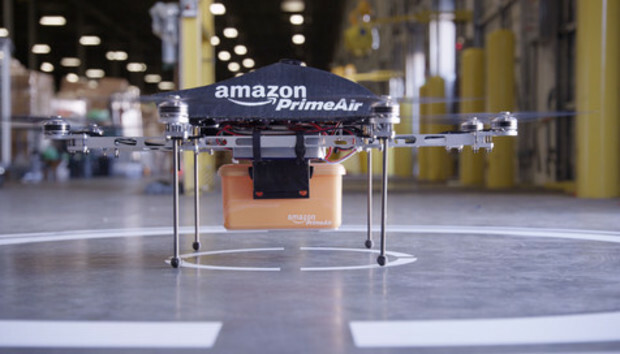 Amazon made headlines this month when it sought permission from the U.S. government to test its drone-based delivery service, but it's far from the only company that's applied for such approval. In the past two months alone, at least 14 other companies have sought permission to fly drones for commercial purposes as diverse as shooting movies and inspecting oil rigs at sea, according to applications to the U.S. Federal Aviation Administration reviewed by IDG News Service. The FAA allows drones to be flown under the existing model aircraft regulations, but only for "recreational or hobby purposes, and within the visual line of sight of the operator." Commercial flight is specifically prohibited, and companies wanting to test drones for commercial use must obtain an exemption from the FAA. Trimble Navigation is one such applicant. It's best known for GPS navigation systems but also makes products for surveying land, such as construction sites. It wants permission to fly its UX5 drone, which takes high-quality images used to build contour maps of the area, among other things. Yamaha Motor, best known for motorcycles and keyboards, wants permission to use its RMAX remote-controlled helicopter for agricultural services, which include things like "precision crop-spraying." The company says the RMAX is already in use in Japan, Australia and other countries. "Yamaha seeks the exemptions to bring the commercial benefits of the RMAX to the United States," it says. VDOS Global, a company that deploys drones to collect sensor data in "hostile environments," wants permission to use an Aeryon SkyRanger drone to inspect gas flares on Shell oil rigs in the Gulf of Mexico. In its application to the FAA, it said using a drone would be much safer than sending a worker for the inspections. Several other companies want permission to fly drones for TV or movie camera work, while still others didn't specify the reason. In its own application, Amazon said it had built a ninth-generation drone capable of flying at 50 miles per hour, but that it was limited to testing "indoors or in other countries" because of the FAA rules. It hinted that it might take its work overseas if it can't conduct research in the U.S. "Amazon would prefer to keep the focus, jobs, and investment of this important research and development initiative in the United States by conducting private research and development operations outdoors near Seattle," it said. The legal situation for commercial drone use is still foggy, and the FAA is accepting comments on what regulations should apply. A monthlong comment period was recently extended to late September and has already attracted close to 30,000 comments. Last week, some university professors sent an open letter to the FAA, saying its drone rules could have "severely detrimental impacts on education and research in the United States." "We understand and share the FAA's concern about model aircraft being operated in places where they do not belong and creating a hazard to manned aircraft operations," the professors said. But "overbroad" regulations will "chill and thwart responsible parties" such as universities, while doing "little if anything to restrain those who actually could put the safety of the public at risk." The FAA has fined at least one drone operator for commercial operation, although an administrative judge dismissed the US$10,000 penalty earlier this year, saying the FAA exceeded its jurisdiction.